I understand that using vanilla JS within Angular to directly manipulate the DOM is generally frowned upon, but sometimes when working with a number of dynamically created elements that need referencing it’s the easiest way to go. So, below you’ll see mostly vanilla JS with some TypeScript functions and scoped variables. The first thing we need to determine is how we want to structure the HTML of the page. I’m using HTML tables for this light-weight version because there’s less CSS and JS needed, but later will convert to CSS grid with just DIVs. Every month’s table layout is different depending on the month and year, but first we need to set some defaults and variables. // get the first day of the month. this is an enumerated index, so 0 is Sunday and 6 is Saturday. // using a 0 param in the day slot of Date() gives you the last day automatically. fantastic. Once we’ve set up all of the data we need. We have to build the calendar accordingly. I have this all within the function createTable() so that any time the month or year changes we can call it afterwards. Determine whether the day is in the “past”. The fun thing about the createTable() function is that if we simply subtract or add to the scoped “this.month” variable we can run this function again and it works. Now we have our layouts, but what about adding events? The nice thing here is that since we have an ID on every single TD element we can create a listener on every TD element and then grab it’s corresponding ID. This is within the createTable() function so that every time a new calendar view is generated the listeners are set up. Below you’ll see how the faux element is within the TD and the modal appears to the right of the date with the appropriate input fields. I’m doing some calculations to determine the position, but either way, notice how the date and time are already set respectively (it’s 10:50am here in Houston). Granted, I added some CSS so it’s not so boring. Our company’s API is very complex and flexible, so we won’t get into the data aspect of things, but you’ll notice on the image above we see some saved events already. Here’s how I loop through the array of events I get back from our API and display them in the correct table cells. Now that we have our events displaying in the view, we need to update our listener on click to determine if the user is creating a new event or trying to view/edit an existing one. You’ll notice that our function before was named “AddEditEvent” for this reason. Kinda ripping off Google’s design. Sincerest form of flattery, right? 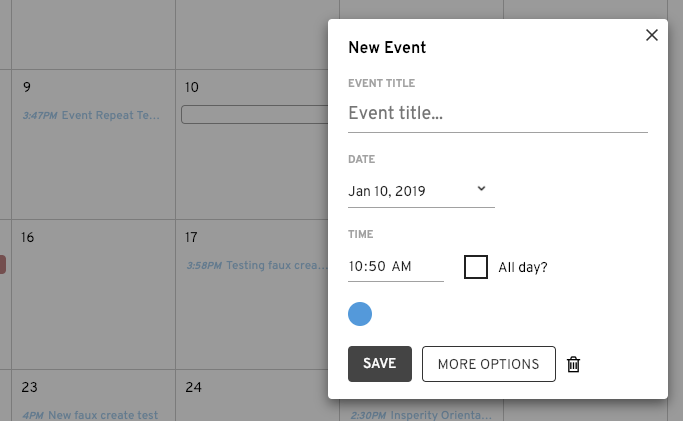 In the final version above you’ll see that I added more functionality that allows for all day events and display of the time, but overall what I’ve shown in this article is about 60% of the overall code for a usable lite-weight calendar. Of course, the CSS I will leave to you.